I’ve been meaning to show you this recipe for months. At the beginning of summer, I began making these bowls for dinner and haven’t really stopped. I idled back on posting it because I figured it was too simple or too hippy or too Julia, but after making it dozens of times, I realized a few of you out there may form the same bond. …It’s just such an easy meal and it checks all my boxes. It’s easy on my digestive system, not overly carby, nutritious, protein-packed and full of healthy omega-3 fatty acids. 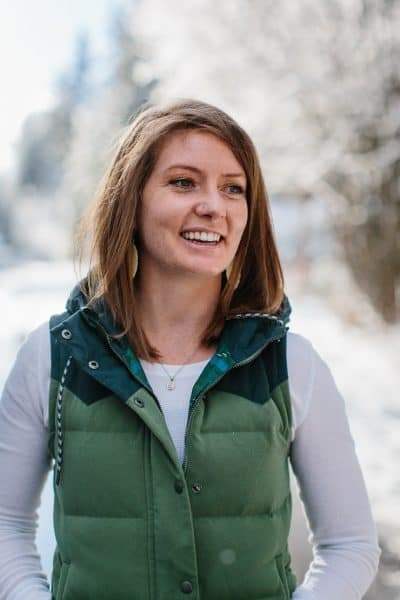 In essence, it’s a dream come true for those of us who follow a Low-FODMAP, paleo, keto, or low-carb diet. And for those of you who follow none of the above? Well it’s just a really tasty, clean meal! Perfect for basically anyone looking for a filling, feel-good meal. If you aren’t a fan of spaghetti squash, no sweat. You can make zucchini rice or zucchini noodles, or sweet potato rice or regular rice if you aren’t low-carb. 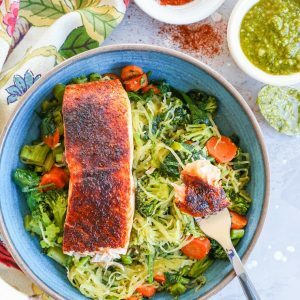 Essentially, you can swap out the spaghetti squash for any of your low-carb lookalikes. The pesto sauce is what makes this meal oh-so flavorful. I use my Low-FODMAP Pesto Sauce (it’s garlic-free and dairy-free for those of us with intolerances), but you can really incorporate any pesto sauce your heart desires. In fact, you can check up on my classic Basil Pesto Sauce, Beet Green Pesto, Broccoli-Pumpkin Seed Pesto, Roasted Beet Pesto, Kale Pesto, etc., etc. Let’s talk vegetables. I saute carrots, broccoli, and spinach, but you can use any of your favorite seasonal produce. I also like adding zucchini, bell peppers, and sweet potatoes from time to time…get creative with your sauteed veg! Lastly, crispy salmon is basically my lifeblood. Salmon is a big part of my protein intake, and as you may have heard me shouting from time to time, I prefer it crispy. I simply sprinkle salmon with sea salt, paprika, and any other spices I feel like on that particular day and pop it in the oven under the high broil setting. It’s done 10 minutes later…15 minutes tops (depending on thickness). You can incorporate your favorite animal protein or go vegan by adding chickpeas or black beans. Make the pesto sauce up to 7 days in advance. Saute the broccoli and carrots to 2 days in advance. In my opinion, salmon is best when eaten fresh out of the oven, but you can cook it up to 3 days ahead of time. That’s all she wrote on this one, folks. It’s easy, it’s (IMO) delicious, it’s healthful, all natural, real, won’t talk back or call you names…I’ll stop. Cook the spaghetti squash according to these instructions, and prepare the pesto sauce. Once the spaghetti squash has finished roasting and is cool enough to handle, use a fork to release the "spaghetti" strands, then add them to the skillet with the sauteed vegetables. Add the pesto sauce and sea salt and stir well. Taste the veggies for flavor and add more pesto sauce or sea salt to taste. Turn the oven on the high broil setting. Lightly spray or oil a casserole dish and place salmon fillet in it. Drizzle salmon with avocado oil and use your hands to smooth it over the flesh so that all the flesh is lightly coated in oil. Sprinkle with paprika, ginger, and sea salt. Broil on the second to the top shelf of the oven for 10 to 15 minutes (depending on thickness of fish), until salmon is golden-brown and crispy. Allow salmon to rest 5 minutes before cutting into smaller pieces for serving. Divide the spaghetti squash and sauteed vegetables between 2 or 3 bowls. 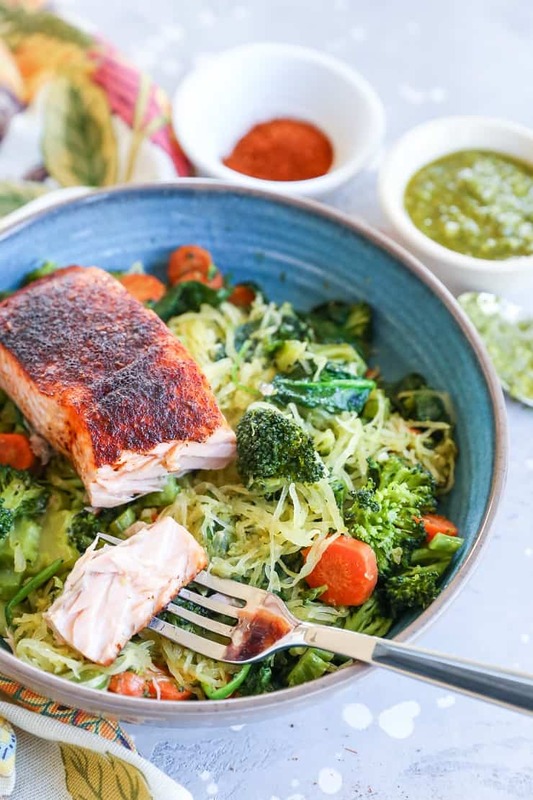 Top with crispy salmon and serve. 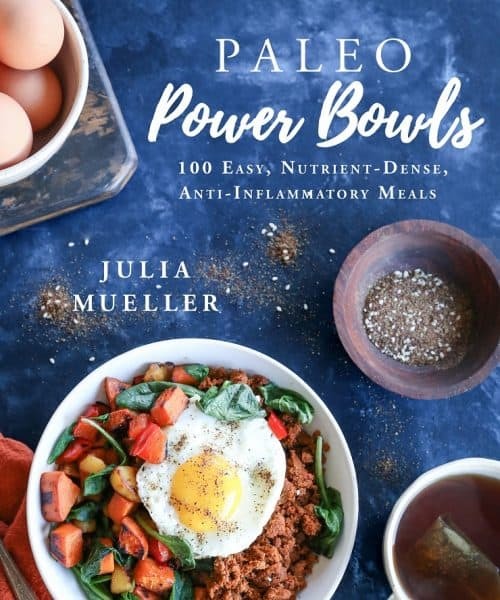 This meal checks all of my boxes too and if a meal is “too Julia” you definitely need to post it. LOL . 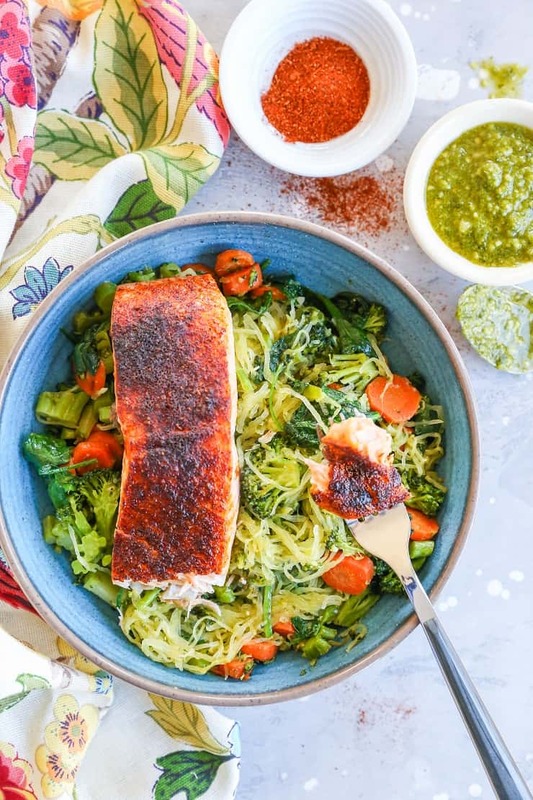 Spaghetti squash, salmon and pesto are things I could eat every day — this is going on the menu soon! This looks amazing and definitely making…probably tonight! If I made the full serving size to keep for more meals, do you think if you keep it separately it would last ok for two days? Absolutely! I prepare this as a meal-prep situation frequently, knowing there will be leftovers. It keeps really well 😀 Hope you enjoy! This looks AMAZING! I can’t wait to make this! Pinning for later. Thanks, Jane! I’ve been loving it!